There are a number of online slot machines available which are based on the theme of comic book superheroes; for example Marvel Comics characters appear in a number of classy games. 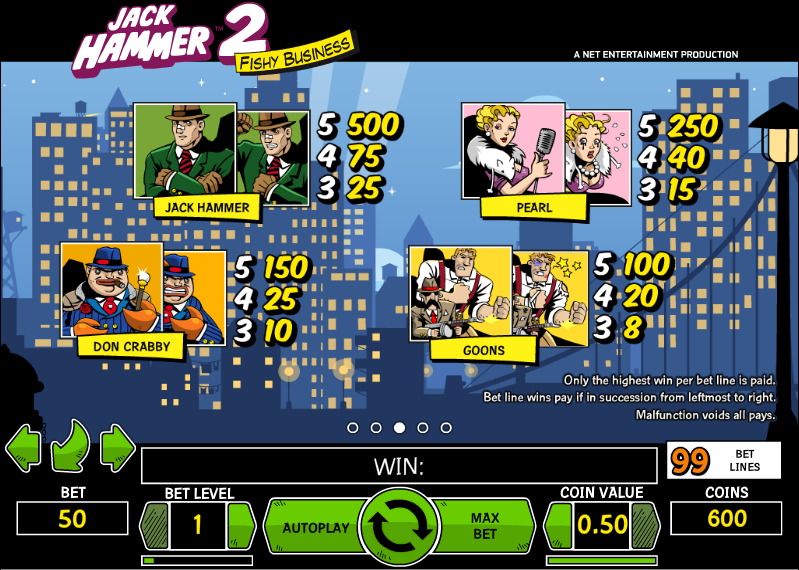 Jack Hammer 2: Fishy Business is a little different in that the theme is Marvel’s Jack Hammer but the slot is designed to look like a comic book. It’s a great looking release by Net Entertainment in which the art resembles a comic book style from previous decades as you can see from the screenshot above. There are five reels and an impress 99 fixed paylines which offer a huge range of opportunities for profit. 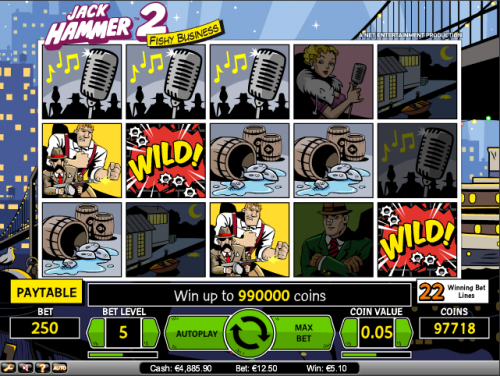 There are no standard symbols here, just nicely designed comic graphics – the lower value symbols are a microphone, a gun/violin case, barrels of fish, a speedboat and a dock while the higher value symbols are the characters – Goons, Don Crabby, Pearl and Jack Hammer himself. There is also a bullet-riddled wild, an electric eel free spin symbol and two random wilds which appear during the free spins round. The best feature is in the main game and it’s Sticky Wins; if you land a winning combination, those winning symbols will freeze for the next spin which is free. If any more symbols add to the winning combo they also freeze and again the next spin is free – the spins continue until you stop adding to the winning symbols when the total prize is calculated. The 99 paylines comes in useful here as that means just one extra symbol can often mean another win and another free spin. If you can land 5, 6, 7 or 8 electric eels then you’ll receive 10, 13, 16 or 20 free spins; any wins you spin now are multiplied by two and a wild card appears on a random symbol on each spin. This becomes an extra value bonus when you start landing Sticky Wins during the feature. 99 fixed lines mean there’s a minimum bet per spin of €0.50 and a maxed out wager of €250.00. There’s an always welcome Autoplay feature but it’s the great graphics which should keep you playing Jack Hammer 2.